Garage door safety is incredibly important, so we wanted to do our part by providing you with some helpful overhead door tips. Our technicians are always working hard to prevent accidents and breakdowns, so if you need some expert attention don’t hesitate to contact us. Perhaps the most dangerous problem your door can have is a broken spring. If this happens the entire door can potentially fall onto whatever’s beneath it, and you will be unable to open it until the spring is replaced. Therefore, it’s essential to regularly inspect your torsion or extension springs for signs of damage and corrosion. If your door wobbles when it moves, or struggles to support its weight, it’s often a sign that your springs need to be replaced. All modern door systems are fitted with photoelectric “eyes” that can detect if anything’s in the door’s path. If something is, they’ll immediately stop the door's movement and reverse it, helping to prevent your door from closing when it shouldn’t. These sensors can become blocked, or misaligned, which will prevent them from doing their job properly. Take a look at them to make sure they’re clean and properly positioned. You can also check their performance by placing something under your open door and checking to see if it hits the object when you close it using the opener. Like any complex machine, the mechanical parts of an overhead door system aren’t designed to last forever. Tracks rust and become bent, rollers wear out, and cables begin to fray. It’s essential to spot these issues before the part in question breaks completely. Visually inspect your door's hardware components on a regular basis (or better yet, have our experts do it), in order to catch any aging, worn-out parts that need replacing. Every year, hundreds of enthusiastic homeowners end up hurting themselves or damaging their garage doors by attempting to perform some DIY repairs. It’s completely understandable to want to try and fix problems by yourself, and there are certainly some things you can take care of; lubrication and cleaning, visual inspections, door control adjustments and so on. But many parts of your garage door can be very dangerous; springs, tracks, door panels and more can easily cause injury if not handled by professionals. That's why you should leave things up to us if there's a problem with any of these parts. Your garage is used on a daily basis, which is why it’s essential to keep it in a safe working order. Follow these aforementioned tips to make sure your safety isn't compromised. 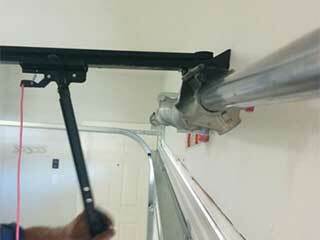 If you find something wrong, contact Garage Door Repair Spring immediately to have our team deal with the problem.